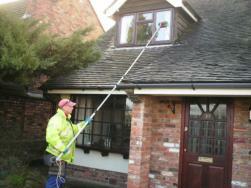 Pure and Clean Window Cleaners began in 1983 as Fosters Cleaners, using traditional Window Cleaning techniques. before beginning to take on Commercial work. As the amount of Commercial work has grown, we have invested in poles that reach to 50 Feet, enabling us to reach to 5th floors on most buildings, without the use of Access equipment. This enables us to provide an excellent service to our Commercial customers at an affordable price. We have recently added annual external maintenance plans to our services, these enable our customers to pre-book our cleaning services, for the upcoming year to ensure our availability at extremely busy times. As many of our clients now use internet banking, we have added a Paypal payment system to this site. Please, take a good look around this site, to see greater details of all our services. Business is looking up ! 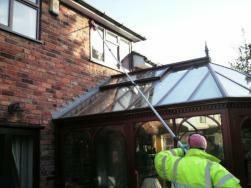 This picture demonstrates the ability to clean windows above sloping rooves without having to walk on the tiles and therefore prevent the possibility of damage to the tiles. 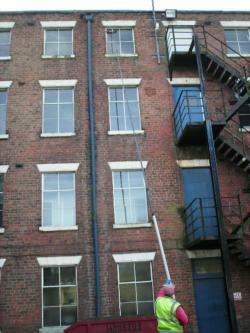 This picture demonstrates the ability to clean windows at a high level from the safety of the ground. 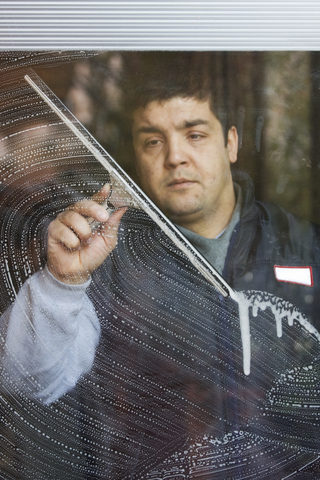 We still use traditional Window Cleaning techniques for Shop Windows and for internal window cleaning.